For centuries the placenta has received ceremonial handling by many cultures around the world. In western medicine the human placenta is usually regarded as nothing more than human waste. The Kikuyu of Kenya place it in an uncultivated field and cover it with grains and grasses, while other cultures bury it in the dirt floor of the family’s house. In Mali, it is thought that the placenta can affect the baby’s mood or even make the baby ill. The placenta is washed, dried, placed in a basket and buried by the father. A belief held by many Arabs is the future fertility of a woman is connected to the disposition of the placenta. Should something unpleasant happen to it the woman might be rendered sterile. In some cultures such as Vietnam and China the placenta is viewed as a life-giving force. Therefore, it is dried and added to certain placenta recipes in order to increase a personâ€™s energy and vitality. In Indonesia, the placenta is seen as the babyâ€™s twin or elder sibling and is perceived as the baby’s guardian throughout life. It is the fatherâ€™s responsibility to clean, wrap, and bury the placenta on the day of the birth. In Korea the placenta is often burned and the ashes kept. During periods of illness the ashen powder is given in a liquid to help heal the child. Among the Hmong culture, the word for placenta can be translated as “jacket,” as it’s considered an infant’s first and finest clothing. The Hmong bury the placenta outside as they believe that after death, the soul must journey back through the past until it reaches the burial place of the placenta and await rebirth. In Cambodia, the placenta is carefully wrapped in a banana tree leaf, placed beside the newborn baby for three days and then buried. In Thai culture the placenta is often salted and placed in an earthen jar. On a day deemed auspicious for burying this clay pot, a site is prepared and the placenta is laid to rest. The jar is buried under a tree that corresponds to the symbol of the Asian year of the child’s birth and depending on what month the child was born dictates which bearing the pot faces. The commercial use of “placenta extract” found in some cosmetics, such as facial cream, is sold in France. In 1994, Britain banned the practice of collecting placentas in hospitals from unsuspecting mothers, after it was learned that 360 tons of it were annually being bought and shipped by French pharmaceutical firms. They used it to make a protein, albumin, for burns and to make enzymes to treat rare genetic disorders. For Navajo Indians, it is customary to bury a child’s placenta within the sacred four corners of the tribe’s reservation as a binder to ancestral land and people. The Navajos also bury objects with it to signify the profession they hope the child will pursue. In Hawaii the placenta is brought home and washed, then buried following a religious ritual with a tree planted on it. It is believed this binds the child to his or her homeland. The â€œieweâ€ (placenta) of the newborn child is sacred and must be handled in a sacred manner in order to provide for the physical health of the child. In some regions of South America the placenta is burned after birth to neutralize it and planted in the ground to protect it from evil spirits. New Zealand Maori gift the Placenta or Whenua as a gift to Papa Tua Nuku or Mother Earth. In Maori, the word for land and placenta are the same – whenua, and illustrates the connection between them and it is usually planted with a tree on family land. Some Aboriginal tribes bury the placenta either under the tree where they birthed or under an ant pit for the green ants. Many believe that when the green ants eat the placenta no more babies will come or at least not for a while. In Samoa the placenta must be totally burned or buried so it will not be found by evil spirits. Burying or burning it at home also ensures the child will remain close to home as it moves through life. 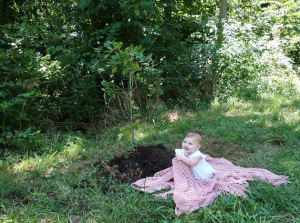 If buried under a fruit tree, the placenta provides nutrition for the tree that in turn will provide years of nutrition for the child.